Let’s settle in with Natalie Pelykh. See her patterns on Ravelry. Follow her on Instagram. The most exciting thing in designing – the possibility to create every time something new and unique. Each of my projects is a different story. Sometimes I spend a lot of time thinking and drawing sketches, diagrams, knitting and ripping samples and only after a long preparation work I start to create something new. And sometimes an element of architecture or beautiful flower is so inspiring that I go home, take yarn, needles and something new is born in a few minutes. 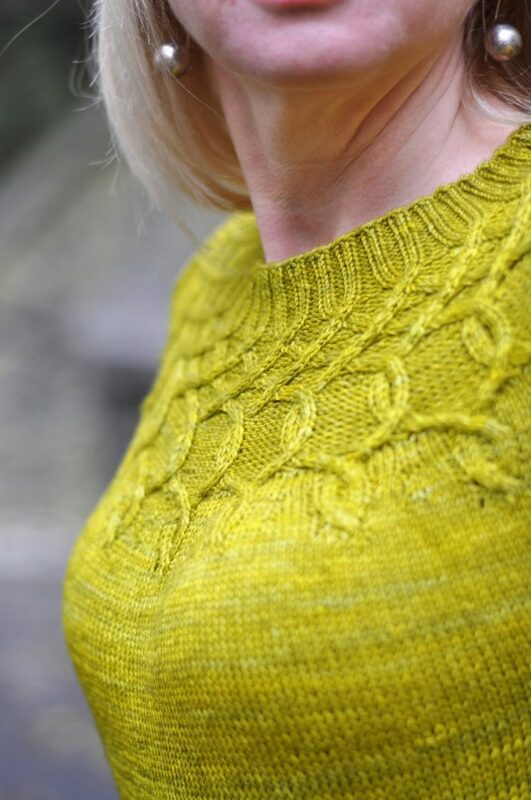 I like to communicate with my talented test knitters and the most rewarding part of the tests is the results of the test knitters’ work. Every time with special excitement and trembling I wait for it, sometimes I see it even in a dream, the fantasy draws its image through the few outlines that I manage to see before our first meeting … and here comes this day! The day I see it, the first finished project of my design in testing! With what I can compare this day – perhaps with the birth of a child, because not only designs, but all works of testers are dear to me as children! Ukraine is a country wealthy of nature, gorgeous colors, flowers and variety of plants. I am surrounded by ancient architecture of Kievan Rus. Of course, all this inspires and is reflected in the patterns and models created by me. Yes, I’m full time designer, and knitting is life style for me. But…Life cannot consist only of a hobby or work. To get full satisfaction and be happy, you need a balance in all areas of life – family, children, health, and home. Sometimes it is not so easy to learn how to find a “middle ground” in all of this. But I’m trying! And I have a wonderful assistant – my family, my beloved children, and my beloved husband that make my life really happy. A few years ago I discovered a new activity for myself – the creation of Family look and I really like this kind of my work! There are a lot of opportunities when you create garments that are slightly different each other, but they have general features suitable for the youngest family members as well as for adults. In the nearest future, I have a few projects that I wish to bring to life. And, of course, hats! I just love to design new hats with cabled crowns! Oh, I love shawls but….I do not knit them…so I can only dream about such a present. I like natural fiber, be it natural cotton or merino wool. Garments from these materials are comfortable to wear, hold up well to everyday use and are haptically pleasant, too. I don’t have particular brand preferences, I like to experiment with yarns and try out new ones – what a blessing that nowadays such a great variety of factory-made yarns as well as those from artisan masters is readily available! Success is not an exact formula, following which you can create a unique thing.Everyone has her/his own way to find, with mistakes and lessons learned. Create something of your own which is unique – this will be your success!